The side of this new’n’shiny chip wagon says “Not your ordinary chip truck”… so expectations were high! Fortunately the friendly fellas working in this truck lived up to them. The chips here are good, although I find them a little light in colour (that seems to be how people like them in this part of the world though.) Peter loves the poutine, and most importantly, THE CHICKEN BURGERS ARE AWESOME!! They bread and fry a flattened breast of chicken, and it is sooooo tasty. Served with tomato, lettuce and mayo, I could eat these every day. If I was a hollow-legged teenager again. Bonus points for the picnic tables, umbrellas and the nice and clean and bright truck. 5 stars out of 5!! 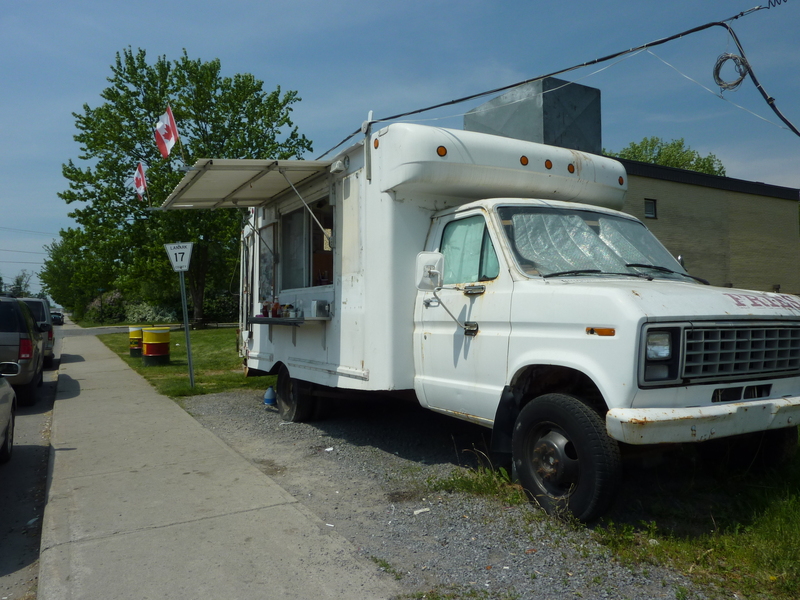 Willy's Wagon - An Almonte classic! Nan apparently passed the torch (or fryer?) to someone named Willy for 2010, and it seems like she passed the recipe box too. The menu is the same as it was, pretty standard chip wagon fare like hotdogs, fries and onion rings. The fries here are Peter’s favourite, but again, I find them too pale. I like mine a nice deep brown! Willy’s gets bonus points for friendly staff, easy parking, and for letting you put vinegar and salt halfway. 4 stars out of 5. This one stands out, since it is painted BRIGHT PINK! Yes, pink. Here, my favourite thing is the sweet potato fries – they are super fresh! (I saw them cut the sweet potatoes.) 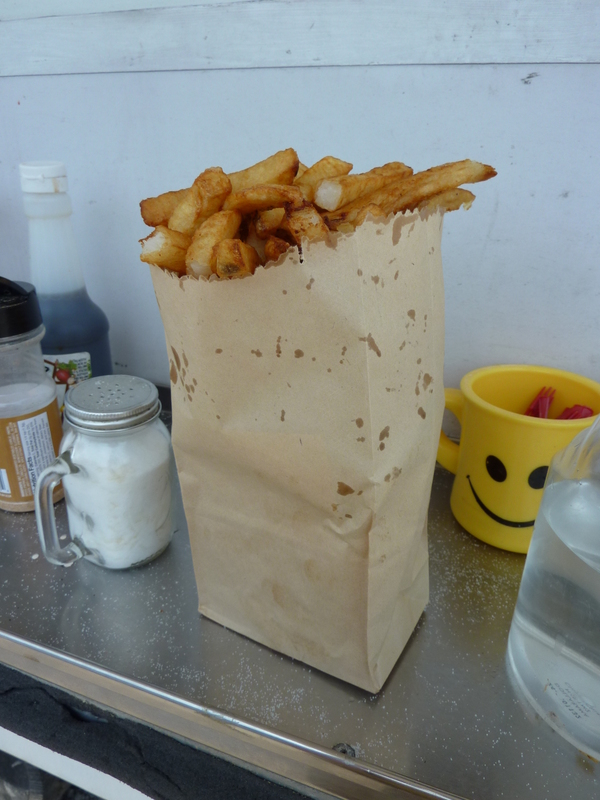 There was a surly customer ahead of me in line here who complained that his fries were – wait for it – TOO DARK! He said it was a sign they hadn’t cleaned their oil in months, and I told him (sort of snottily) that they had only been open for a few days. In any case – I loved finally getting me some nice dark fries! And he said he wouldn’t be back, so no worries about seeing Mr. Grumpypants again. Bonus points for marketing (pink!) and student discounts. And sweet potato fries. 4 stars out of 5. And that was actually the end of the experiment, since my arteries couldn’t take any more. There are more wagons, one at the corner of Mill and Bridge and Mike’s in the “Wee Bee” parking lot on Ottawa St., but we were too full to carry on. So this is not a complete review, but its a start. A delicious start! Come to Almonte, have some chip truck chips!! 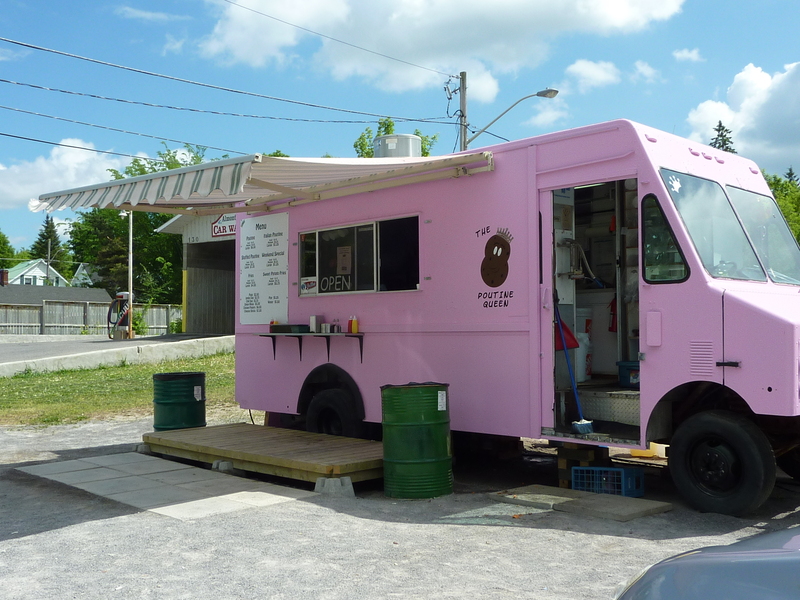 PS – Just so you know, I recommend trying these Almonte chip trucks, but no chip truck anywhere in the world will ever be better than Ye Olde Chip Truck chips in Kenora. You can take the girl out of Kenora….